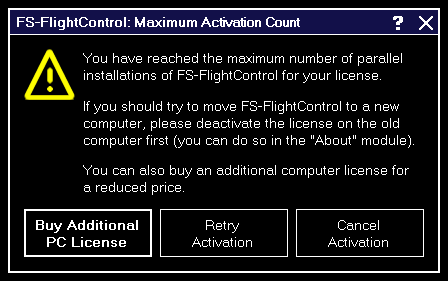 This dialog is displayed when you tried to activate FS-FlightControl on more computers than you have purchased licenses for. If you should try to move FS-FlightControl to a new computer, please deactivate the license on the old computer first: You can easily do so in the Info module. After deactivation of the license on the old computer you can activate it again on a new one. If the deactivation on the old computer should not be possible for some reasons, please contact us. In case you need more licenses, you can purchase them for a considerably reduced price. Just click on the button Buy Additional PC License in this dialog.